Using a Teradek Bond Pro video transmission system, Irwin Video can facilitate a cost effective live video feed for whatever live event transmission you require. We have the equipment and the expertise to transmit live HD video from any location with adequate 3G/4G cellular coverage. The Teradek Bond system works by combining the upload speeds of up to six mobile broadband dongles across all available networks. 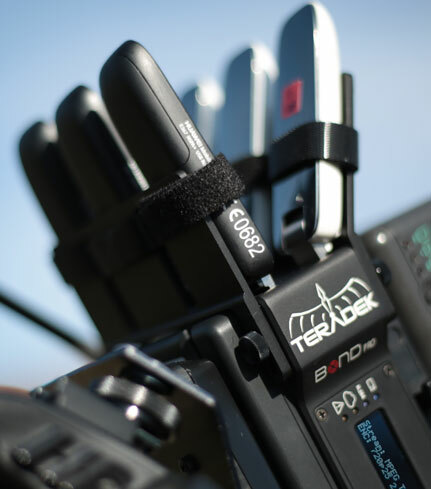 The Teradek Bond Pro transmitter is designed to sit directly on the back of a professional video camera, but for indoor shoots, we tend to mount the transmitter on a stand near to outdoors and send a cabled feed from a camera or vision mixing desk. We have successfully used the Teradek Bond transmitter for live video webcasts and web streams from locations where there is no broadband access. Also, there are many venues where broadband is available but the speed is insufficient or is unreliable because it is shared between too many users. Using the Teradek Bond system takes away the issues and uncertainty of fixed local broadband, without the costs of using a satellite broadcasting truck. Our video web streaming service from any location is a low cost solution to webcasting from anywhere.